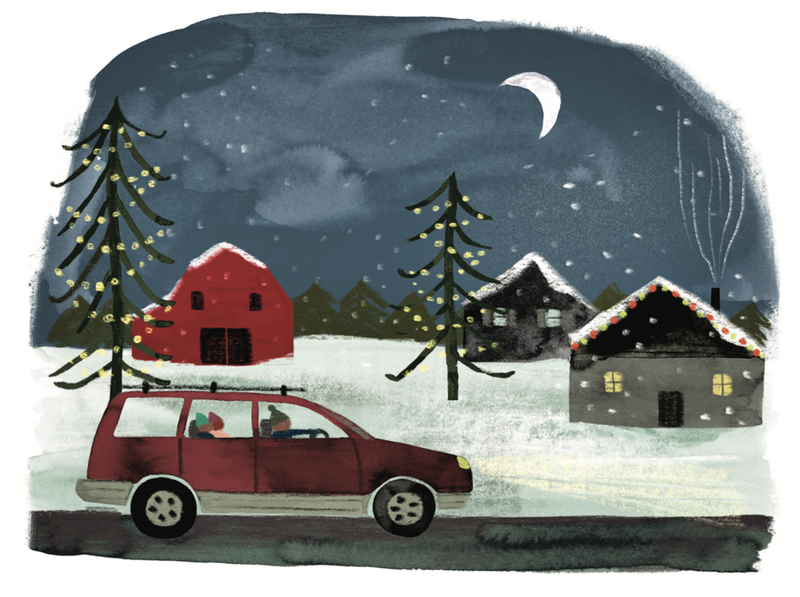 As Winter gets older we find ourselves adapting, revising and starting new holiday traditions. Last year I wrote a post on our holiday traditions (here). This year I really want to focus on making the magic of the holiday spirit last throughout the year. Below are three meaningful ways to achieve a little extra holiday cheer. You can download beautiful artwork like this one that was in the Magnolia magazine here! Save Your Tree Ring Cross-Sections: The other day Perry surprised me with a small present under the tree. When I opened it, I discovered a tree ring cross-section that he had cut off from our Christmas tree from last year and turned it into an ornament. He used letter/number stickers to record the date and location of where we cut it and sealed it with a high gloss polymer. I couldn't believe he held onto to it for an entire year. This will most certainly become a tradition. I can only imagine how cool it will be to look back at all of our tree ring cross-section ornaments when we are old and gray. Stocking Love Letters: This idea came from The Magnolia Journal: Winter 2017 Issue and I just loved it! As you pack up your stockings this year, have everyone in the family write a small note to each person in the family and put them in their stocking for next year. When it's time to put them up again, everyone will be greeted with little love notes. What a beautiful and meaningful way to kick off each holiday season. Save Your Holiday Cards From Last Year: This idea came from a neighbor. This year, save all the holiday cards that you receive from friends and family. When you send out your holiday cards next year, include the one that they sent you the previous year with a little post it note on your favorite memory of them from the year. When they open your card they will be surprised and delighted to read your thoughtful and special note. Do you have any other ideas? I would love to hear them. Write them in the comments below!